The chashaki is a Handcrafted bamboo Matcha scoop in the Japanese tea ceremony instead of a teaspoon, this is a simple, elegant tool for measuring the correct amount of Matcha powder per serve. 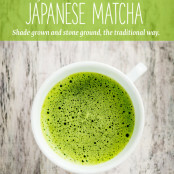 Two scoops with this bamboo chashaku equates to about 1/2 teaspoon of Matcha, perfect for a single serving of tea. Bamboo, 18cm, To clean, wipe the scoop with a soft cloth to remove any remaining tea particles. Matcha joins the line up!